A fairly youthful city when compared to older and more historic Polish cities, Warsaw is Poland's progressive capital city and home to an impressive cultural scene, with endless theatres and opera houses. Devastated by war damage in the 1940s, it was not long until the city rose once more, restoring its most important castles and palaces to their former glory. Warsaw is based either side of the River Vistula and visitors should not be put off by their first impressions, when stepping outside of the Warszawa Centralna train station and onto the rather uninviting concrete street of Al Jerozolimskie. The city does in fact contain a number of truly magnificent Polish palaces, and its views of the iconic Royal Castle are really something special. For tourism advice in Warsaw, there are a number of tourist information centres, known as Centrum Informacji Turystycznej. The office located within the Central Train Station is well placed for those arriving by rail and features a number of free magazines, such as the popular 'Welcome to Warsaw', which is sure to be of interest to visitors keen to explore. There are countless ways to spend your time visiting this Polish city, with tourist attractions ranging from 5,000 animals at the Warsaw Zoological Gardens, to gondola rides on the large lake within Lazienki Park. Even during the summer months it is possible to practice your skiing on the huge artificial ski slope Szczesliwice, although it is fair to say that many people come here for the views alone, or to take a ride of the thrilling roller coaster, powered by nothing more than gravity. Alternatively, why not enjoy a performance by the acclaimed Warsaw Ballet Company at the Polish National Opera House. 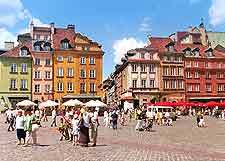 More information about Warsaw Tourist Attractions. 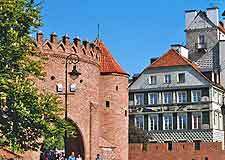 The city centre and the Old Town (Stare Miasto) area both lie on the western side of the Vistula and are where a large number of the main landmarks are based, such as the semi-circular Barbican (Barbakan Warszawski), a fortified outpost dating back to the 16th century. An integral part of the Stare Miasto district are the extremely well-preserved, medieval city walls, which offer a clear insight into city life many years ago and lie next to the Castle Square (Plac Zamkowy). Old Town Warsaw is also home to further architecture wonders, such as the Neo-classical Ratusz (City Hall) and the hard-to-miss St. John's Cathedral. More information about Warsaw Landmarks. If it is museums that you are after, then the Historical Museum of Warsaw will certainly not disappoint and features an extensive collection, full of information about the city's founding, right up to the present day. Also try to visit the National Museum, which contains everything from archaeological treasures to 20th-century Polish paintings, and is perhaps best known for its Faras Collection of ancient Egyptian art, which was rescued when the River Nile once flooded. Art lovers will appreciate the works at both the Warsaw Centre for Contemporary Art and also the Academy of Fine Arts Museum, which is situated in the New Town district, known as Nowy Miasto. More information about Warsaw Museums and Warsaw Art Galleries. Close to Warsaw is one of the largest of all Poland's many national parks, the Kampinos. Lots of visitors head here for the day, to enjoy the surrounding and plentiful wildlife. 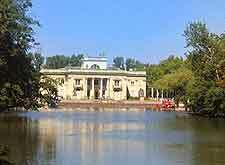 Others prefer to travel to the popular village of Zelazowa Wola, or to the cities of Radom and Lódz, the latter of which contains a number of beautiful Art Nouveau buildings and leading movie studios. Lódz is actually the second-biggest city in Poland and is quite underrated, despite boasting a wealth of monuments, churches and palaces, such as the extremely beautiful Izrael Poznanski's Palace. More information about Warsaw Attractions Nearby.